Sword and Shields are an effective combination of attack and defensive weapons since ages, and so it was no wonder that video game characters would use this type of weapons as well. 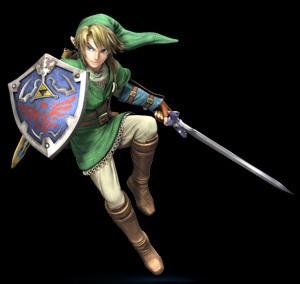 The probably most known Sword and Shield using video game character is Link from the Legend of Zelda games. Depending from game to game, the shield is sometimes more effective, sometimes less. The Sword and Shield Combo can also be seen in many weapon based fighting games, especially in SoulCalibur where you have Sophitia, Cassandra as well as Phyrrah and Patroklos and (sometimes) Lizardman using them. Sword and Shields are also very often used in role playing games.